Many of you have been following the recent statements given by Cardinal Schonborn, Cardinal Hoser, and others on Medjugorje. We have all been waiting patiently to hear news about the 2010-2014 special commission, established by Pope Benedict, which continued the investigation into the ongoing apparitions in Medjugorje. The wait is now over! The Ruini report, named after the chair of the commission, Cardinal Camillo Ruini, has yet to be posted on the Vatican web site. But, I will highlight just a few of the important statements that have been reported. First, it is important to realize that only about 12 apparitions throughout history have been approved by the Church. For an apparition to be judged as “supernatural” in origin, is truly rare. 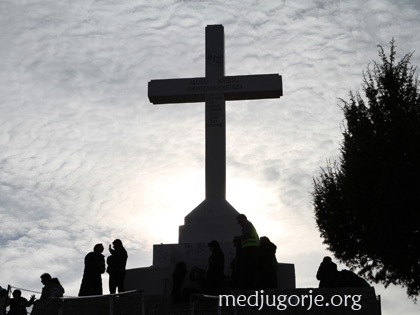 Medjugorje is now among those rare apparitions. When investigating and voting on the authenticity and supernatural basis of the Medjugorje apparitions, the Ruini Commission decided to split the apparitions into two time periods, the first 7 apparitions, and the apparitions from then, leading up to today. With a margin of 13 to 1 the commission confirmed the supernatural basis of the first 7 apparitions. Regarding the fruits of the apparitions from that point to today, all members said there were positive aspects. 3 members and 3 experts stated there are positive outcomes, 4 members and 3 experts stated they are mixed, with a majority of positive effects, and the remaining 3 experts stated there are mixed positive and negative effects. Further, the commission recommended that restrictions prohibiting official Church/parish organized pilgrimages be removed. It was also recommended that Medjugorje be granted the status of a “pontifical sanctuary”, which in itself is a key form of Church approval. The commission also voted in favor of a constitution of “an authority dependent on the Holy See” in Medjugorje, which would place Medjugorje under Vatican control. There was a personal comment made by Pope Francis indicating he was uncomfortable with the fact that Our Lady announces a specific day and time She will appear in Medjugorje. However, the day and time of Our Lady’s appearances have been announced ahead of time in numerous other Church approved apparitions including Fatima, Lourdes, Kibeho, Itapiranga, Laux, San Nicolas, and others. It is important to note that Pope Francis clarified that this comment was his personal opinion. It does not in any way represent an official Church statement or declaration. Pope Francis has entrusted a “special mission of the Holy See”, which is the final task of gathering pastoral information about Medjugorje, to Cardinal Hoser from Poland. The Cardinal has been in Medjugorje for several months now and has made a number of positive statements about Medjugorje: http://www.medjugorje.org/wordpress/archives/169 He is expected to finish his work during the summer of 2017 and give his recommendations directly to Pope Francis. Pope Francis will then use this information to make his final decision. Gods time is the best . Eventually, all will be able to see the light through the Holy Spirit, amen. From the first steps I took on medugorje 2010 Iknew this place was special,Ihad strayed away from my faith for a bout 40 yrs . As the week went on my faith got stronger than ever before I went to confession the very next day I had an experience I will never forget. It made me a better person god bless all .